After the conclusion of the International Military Tribunal at Nuremberg, the trials known as the Subsequent Nuremberg Trials started. The purpose of these trials was to determine the guilt of second-tier Nazis accused of those crimes and contributed to crimes against humanity. 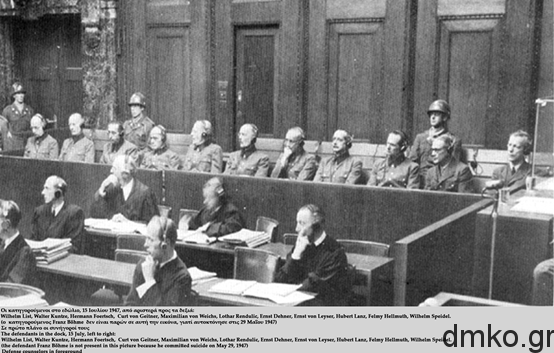 On May 10, 1947 started in Nuremberg the Case VII, the “List Trial” (official title: USA versus Wilhelm List et. Al.”), widely known as the “Hostage Trial”. The defendants were 11 out of 12 Generals, accused of war crimes in the Balkans. (defendant Franz Böhme committed suicide on May 29, 1947). The last two were “punished” as responsible for the Wehrmacht crimes in the area of Kalavryta. Karl von Le Suire, the “leader” and responsible of that massacre never stood trial as a war criminal, but died as a soviet hostage. Everyone sentenced between 1951 and 1953 were released.